There had been rumours for the past few weeks that only one Morgan would be killed in the finale. After Deb was shot by Saxon in the penultimate episode, it looked set to be her, especially after she had just re-joined the force and started to patch up her relationship with Quinn. It also meant that we knew Dexter couldn’t just leave for Argentina once he heard about what happened. But no! The episode opens and Deb has survived the shot and all seems well, but Saxon is still on the loose. It’s enough to delay Dex and there’s still a chance that Saxon will come back to finish off what he started, so there’s little indication as to what’s going to happen to the siblings. Dexter’s goodbye to his son Harrison when he leaves him with Hannah seems to be the ultimate hint that they won’t be reunited. Hannah is the perfect opportunity for Harrison to exit the scenario ready for Daddy is to meet his demise or end up behind bars. She may not be the best surrogate mother for him, but Harrison has always been an awkward character to have around. He made Dexter seem more normal and proved to be quite a complication when Daddy wanted to go off and strap someone to his table. As much as I’ve never liked Deb as a character (in both the books and the TV series), I’ll admit that I began to well up when Quinn broke the news of a complication. It only got worse when the Doctor gave Dex the details about the damage to her brain and there were definitely a few tears shed in the flashback that gave the episode it’s title. I never knew I cared! I guess it also came from Dexter’s emotive response to the news about his sister. Our monster has feelings, and ultimately that’s what this final series has been about. We realise at this point that Dexter is definitely going to kill Saxon and he’s not going to care about covering his tracks. After all, he’s been arrested and is being held at the station. The scene between the two is a little lacking in tension, but the fact that Dex is going to openly kill him is enough to build it up. It’s also quite clear that Batista and Quinn are fully aware that this was no self defence, but cover for him anyway. As Batista urges Dexter to get going, it’s obvious that he wants him gone before it’s looked into in any more detail. 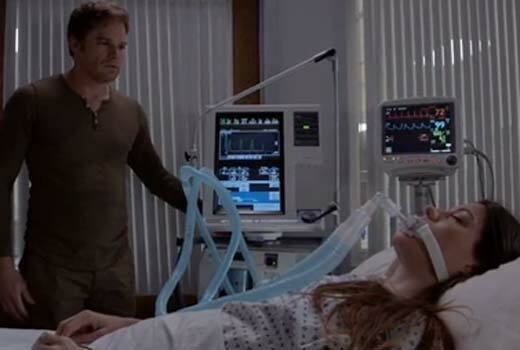 After my emotions betrayed me a little earlier on, I’m ready to admit that during the scene with Deb and Dex in the hospital as he switches off her life support, I cried like a little girl. When he calls Hannah and Harrison, it’s clear that he’s never going to see them again, which I think is the best way for the story to go. Harrison has his new mother, albeit another serial killer, but they will have a new life together. As Dexter throws his peaceful looking sister into the ocean and the sails off into the storm, that should have been it. An apt ending for our anti-hero, not wanting to cause anyone else in his life more pain. As Batista receives a call, answering ‘Dexter?’ there’s definitely some ambiguity there. Has Dexter called him, or has he heard about the wreckage of his boat being found? Then we see Hannah reading an article about him being presumed dead. I’m not gonna lie, the scene with Hannah and Harrison in the café just reminded me of The Dark Knight Rises. I half expected Dex to be sat across the table from her and flash a cheeky smile. Maybe Albert sipping quietly in the corner as well. As ridiculous as that would have been, at this point I was sure that he was still alive. The credits are about to role, but oh no! Another scene. Dex is alive and working as… a lumberjack? What a stupid bloody pointless scene. I get that the creators want to clear up the ambiguity, but in my opinion it cheapened the finale. Better he blast his brains out at that final moment sat at the table in his little cabin. Okay, that’s a little much, but still. The scene wasn’t needed, the ambiguous ending would have worked better. However, Dexter has chosen exile, which to some might be a fitting ending. His voice over has gone, he’s avoiding all human contact and he looks like a shell of the man which he once was. He’s got a beard coming on though, that’s something to be happy about? Besides that final moment, I did enjoy the finale. It was a little less action-packed than anticipated, and Saxon’s death wasn’t a little climatic. However, the idea that Dex just openly killed him in the police station was dramatic and rather fitting. In my opinion, the ending should have ended with it being unclear as to whether Dexter had died, because it was a more climatic and emotional finale. It was definitely an unexpected episode, and I was rather shocked about how emotional it was. Emotion in the show was always a rarity up until the past year and even when Rita was killed so tragically it was just brushed over. Then wham, the finale just exploded with emotion. Ultimately, I felt that series 8 of Dexter was overall a good ending to the show. 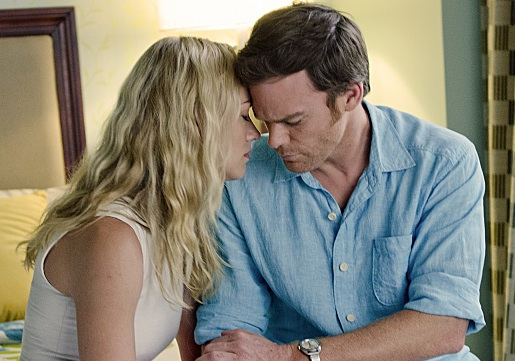 The series as a whole focused on Dexter’s ability to feel for other humans and his willingness to give up his lifestyle for those he cared about. I don’t quite feel that he truly banished his dark passenger by becoming a beardy lumberjack, and think that killing Saxon should have been it for him. Arguably, the show needed Dexter’s demise to full finish things off, but I think a sense of ambiguity would have been enough. His life is over, because he can’t live with what he’s done to those he cared about. His dark passenger ultimately caused his father, wife and sister’s death, despite his actions saving many innocent victims from meeting their own end. I’m sad that the show is over, but it really had run it’s course and I think the finale season worked well as a closer. 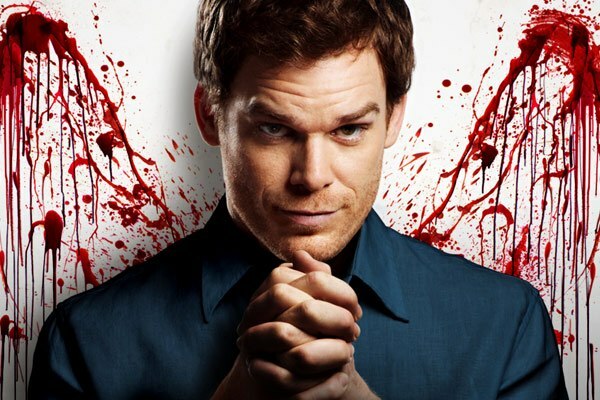 Yes, I think the final scene showing Dexter’s new life was unnecessary, but overall the series served it’s purpose in bringing the show to the end. There have been an awful lot of negative comments about the emotional content of the episode and the lack of action, but there wasn’t exactly much time to play around with. I think it needed the emotion and created a sense of empathy between the audience and our anti-hero. Michael C.Hall really did play the character fabulously and the rest of the cast shined throughout the final stages of the show. I’d love to hear other viewer’s thoughts on the ending of the show, so please comment on our Facebook page or below to let me know what you thought about Dexter’s departure. Should our dark passenger of met his demise, or was it a fitting ending? Now I just need another show about a serial killer to keep me entertained… Oh wait, Hannibal! Score.